Versailles, August 1715. 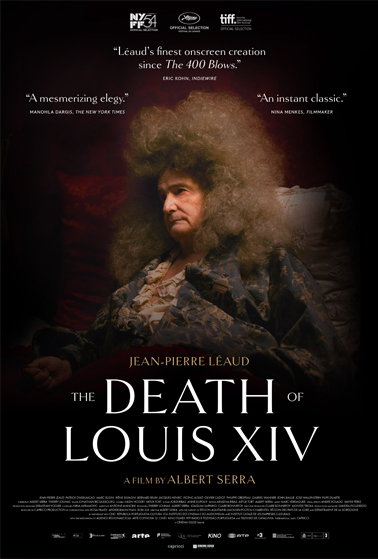 Back from hunting, Louis XIV - magisterially interpreted by New Wave icon and honorary Palme d’Or recipient (Jean-Pierre Léaud) - feels pain in his leg. A serious fever erupts, which marks the beginning of the agony of the greatest King of France. Surrounded by a horde of doctors and his closest counselors who come in turns at his bedside sensing the impending power vacuum, the Sun King struggles to run the country from his bed. "The most beautiful film at Cannes 2016." "Serra has crafted a ravishing, darkly witty evocation of 18th-century aristocracy and a neoclassical period piece as reminiscent of the historical films of Visconti and Rossellini as the modernist literary adaptations of Rohmer and Oliveira."